1. The decision last November by California voters to reform the state’s harsh Three Strikes law so that non-serious offenders no longer receive life sentences appears to be working, the Mercury News reports, citing a new study by Stanford University and the NAACP. The study showed that of the 1,000 inmates released under Prop 36 only 8 have reoffended — an extremely low recidivism rate. The study also blows a hole in arguments made by opponents of Prop 36 who contended that it would cause a crime spike in the state. 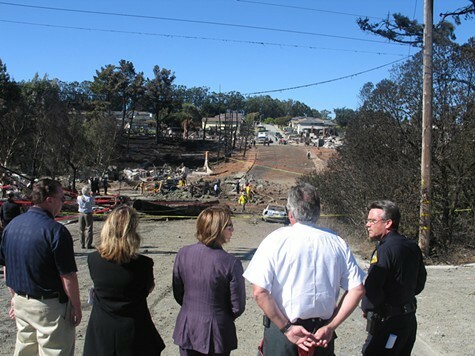 The San Bruno blast destroyed a neighborhood. 2. PG&E has agreed to pay a total of $565 million to 499 victims of the deadly San Bruno pipeline blast in 2010, the Mercury News reports. The legal agreement settles nearly all the lawsuits filed against the utility — although PG&E still faces a potential penalty of up to $2.25 billion from the state. In addition, the Chron reports that state and local prosecutors have decided not to file criminal charges against PG&E or its employees as a result of the blast — although federal prosecutors may still do so. 3. The wildfire on Mount Diablo slowed overnight thanks to cooler weather and is now 45 percent contained, the Chron reports. The blaze has burned more than 3,200 acres and still threatens about 75 homes on the northeastern slope of the mountain. 4. State Assemblyman Tom Ammiano has reintroduced a bill to regulate medical marijuana in California in response to a recent letter from the US Department of Justice that stated that federal authorities would not interfere in states with strong cannabis regulations, the LA Times$ reports. A previous regulation bill by Ammiano failed to win approval in the legislature. 5. And Governor Jerry Brown reached a deal with state Senate leader Darrell Steinberg on prison overcrowding, AP reports (via Rough & Tumble). The deal calls for the state to request a delay from federal judges in order to ease overcrowding over time, but there’s no guarantee that the court will go along with the proposal.